If the current state of your smile makes you feel self-conscious, our team at Valmont Dental Boulder is here to help. A smile that’s missing teeth or that requires dentures can make it difficult to enjoy things like eating, drinking, and laughing that make life worth living. If you feel self-conscious about missing teeth or wearing dentures, Dr. Miller may have an alternative that could be right for you – dental implants. Dental implants make a great option for replacing one or missing teeth or those badly damaged by dental disease. Dental implants offer tremendous comfort, stability, and support so you can return to enjoying the little things like normal. Dental implants are surgical fixtures made from highly durable materials like titanium which the body can easily absorb. Implants are designed to be artificial replacements for natural tooth roots, and can be placed in either the upper or lower jaw. 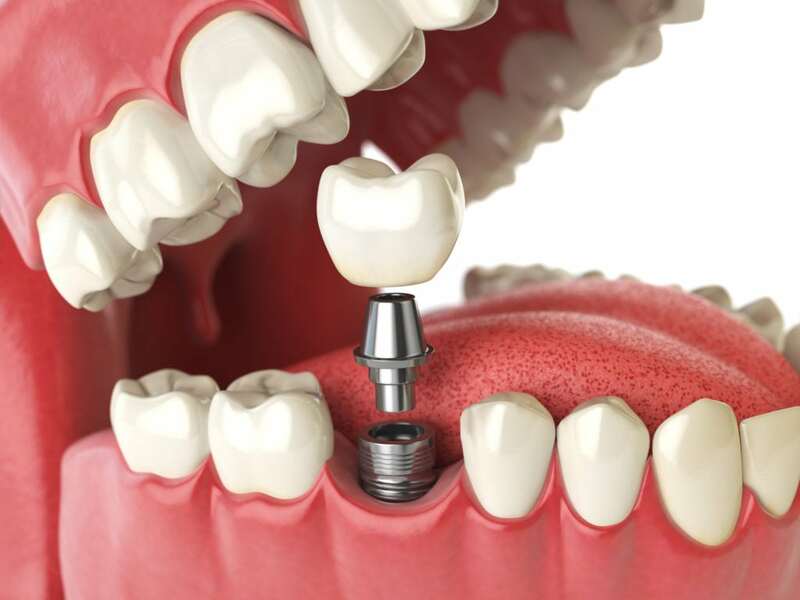 Implants are placed directly into the jawbone and gum tissue to provide a stable base for one or more custom artificial replacement teeth, more commonly known as dental crowns. Dental implant technology has been used by dentists for decades, and has advanced to the point where the placement of implants is more successful than ever. Patients of all ages have elected to use dental implants to replace a single lost tooth or several teeth. Dental implants can also be used to support other types of restorative devices, such as a bridge or dentures. Replacing a missing tooth with a dental implant and crown will not only restore your ability to eat like normal, it will also help to fill out a face that could appear sunken due to missing teeth. However, unlike dentures, crowns cannot be removed for overnight cleaning. It’s vital that patients practice quality oral hygiene to maintain the health and function of their implant. What is getting an implant like? Having an implant placed typically takes multiple visits with Dr. Miller, and can stretch over several months depending on the current state of a patient’s oral health. During the first step, Dr. Miller will conduct a comprehensive examination of a patient’s oral health to determine if they make a good candidate for an implant. Patient’s must be in good health and have healthy gums and adequate jaw bone structure to successfully support an implant. Next, Dr. Miller will surgically place the implant into the jawbone, with the top of the implant raised slightly above the gum line. A cap will be placed over the top of the implant to prevent any debris or gum tissue from entering. Dr. Miller will then secure the gum tissue over the implant. The implant will then remain covered for roughly three to six months while the process of osseointegration – the fusing of the implant to the jawbone – begins. Patients may experience some slight swelling or tenderness immediately following their surgery. A diet of soft foods, cold foods, and warm soups are recommended during the healing process. During the next step, Dr. Miller will uncover the implant and attach an extension, referred to as a post, to the implant. The gum tissue will then be allowed to heal around the post. Some types of implants may require a second surgical procedures where a post is used to attach the replacement teeth. Once the implant has finally healed, the post will act as a base for the new tooth.